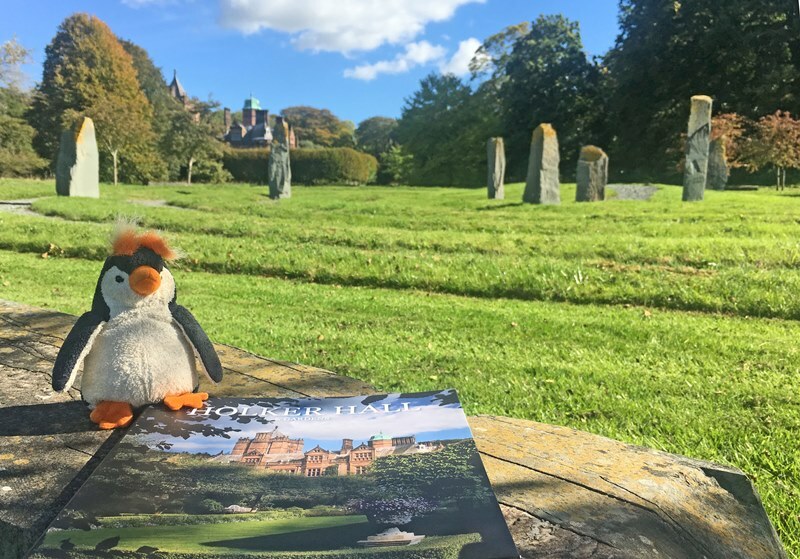 A great wave of tranquility washed over me and for a few minutes, all was right with the world … I was sitting beside a labyrinth and stone circle, gazing across a field towards the Lake District mountains and Morecambe Bay. Crows wheeled overhead and in the distance a herd of deer grazed quietly in the early autumn sunshine. Behind me stood elegant Holker Hall with its beautiful gardens waiting to be explored. Designed by Jim Buchanan together with Grania Cavendish, the Labyrinth was inspired by a design taken from a Hindu temple in northern India. 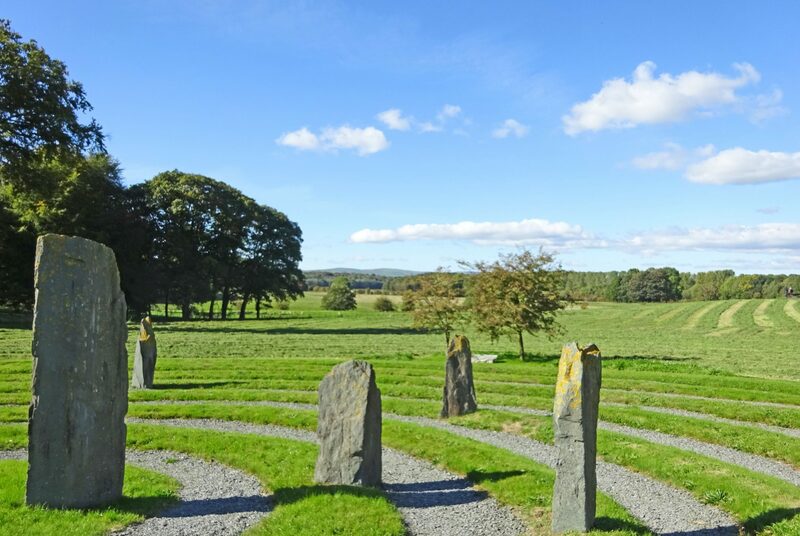 The twelve slate monoliths echo the Cumbrian tradition of stone circles. 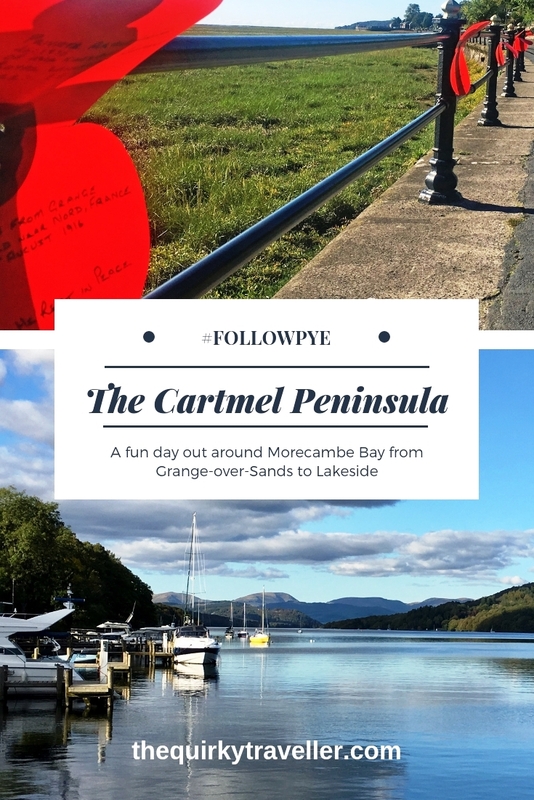 I was on the Cartmel Peninsula on my third #FollowPye Morecambe Bay Day Out. I’d started the day in Grange-over-Sands, going on to Flookburgh, Cark-in-Cartmel and Cartmel village. From there I’d driven on to Holker Hall where I spent a happy few hourse in the house and grounds, before going on to Lakeside and Newby Bridge. 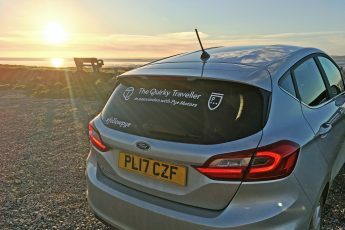 I’m an ambassador for Pye Motors, our local Ford dealership, and have a very nippy, state-of-the-art Fiesta in which I zoomed around, using Seldom Seen Maps to explore this unique part of Cumbria and Lancashire. Grange-over-Sands is a charming Edwardian resort on the edge of the Cartmel Peninsula. 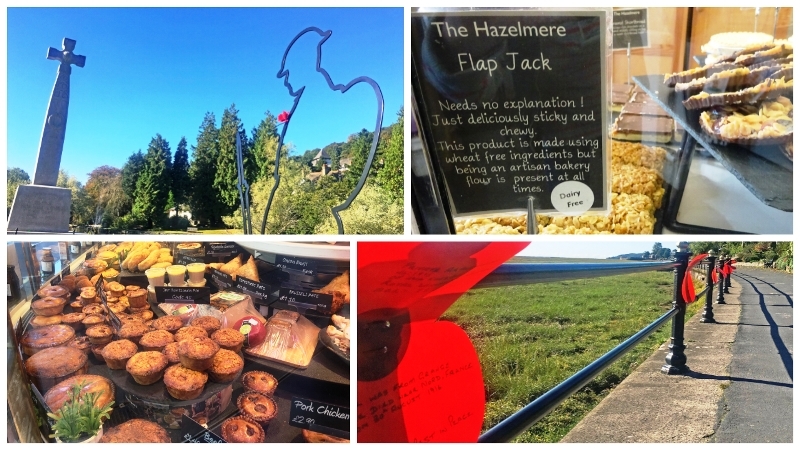 I parked outside Hazelemere Cafe, a cornucopia of bakery delights. After I’d bought a piece of flapjack and a sourdough loaf I crossed the road to the pretty Ornamental Gardens. An elegant lady was feeding colourful ducks which vied with squawking seagulls for pieces of bread. I wandered past the War Memorial and a WW1 Soldier onto the Promenade beside the railway line. Red poppies tied to posts had poignant messages commemorating the end of World War One. My aunt and uncle moved to Grange 30 years ago; in those days the waters came up to the prom. Now grass has reclaimed the land and the sea glitters in the distance. An elderly gent tapped his hat and said good morning and a cyclist dinged his bell as he passed by. Reluctantly I left the town, calling in at award-winning Higginson’s Butchers for one of their yummy Huntsman’s pies. 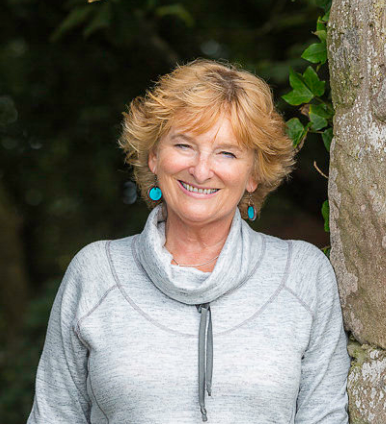 This tiny village has become a foodie pilgrimage with chef Simon Rogan’s Michelin-starred restaurant L’Enclume and slightly more relaxed eaterie Rogan & Co. It’s also the home of the renowned and very delicious Sticky Toffee Pudding from Cartmel Post Office. I popped in to attractive Unsworth Yard, which has a microbrewery, winery and excellent cheese shop. Opposite Unsworth Yard is ancient Cartmel Priory founded in 1190. 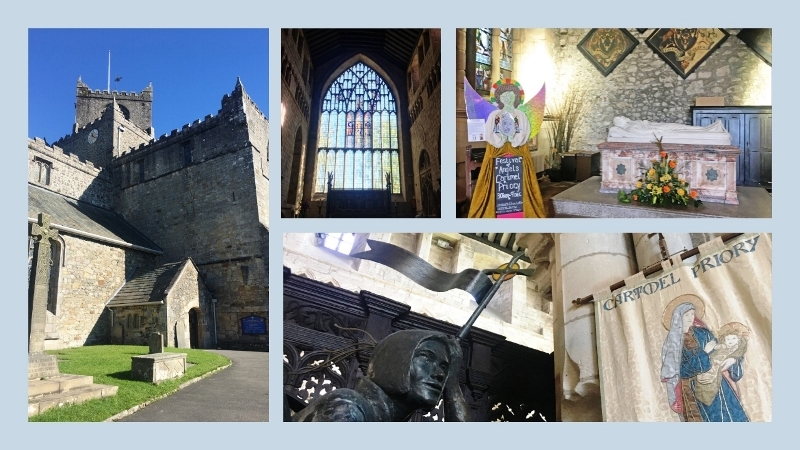 In the 16th century it was saved from Henry VIII’s instruction to “pull down to the ground all the walls of the churches, stepulls, cloysters, fraterys, dorters, chapter howsys” because its founder William Marshal had given an altar within the church to the village, and provided a priest along with it. The villagers petitioned to be allowed to keep the church as it was their only place of worship, and this was granted. I spent some time admiring its cool interior, stained glass windows, alter, tomb of and moving artworks by Josefina de Vasconcellos. Just a few miles from Cartmel is the hamlet of Flookburgh. Flookburgh is sometimes thought to derive its name from a flat fish, known as the Fluke, found in the area. (Many people in Flookburgh say, in fact, that Flookburgh wasn’t named after the Fluke; the Fluke was named after the village.) However, it is far more likely that the name is Norse, an adaptation of ‘Flugga’s Town’. I followed a narrow lane down to the beach, past an old airfield, where the annual Flookburgh Steam Fair is held. 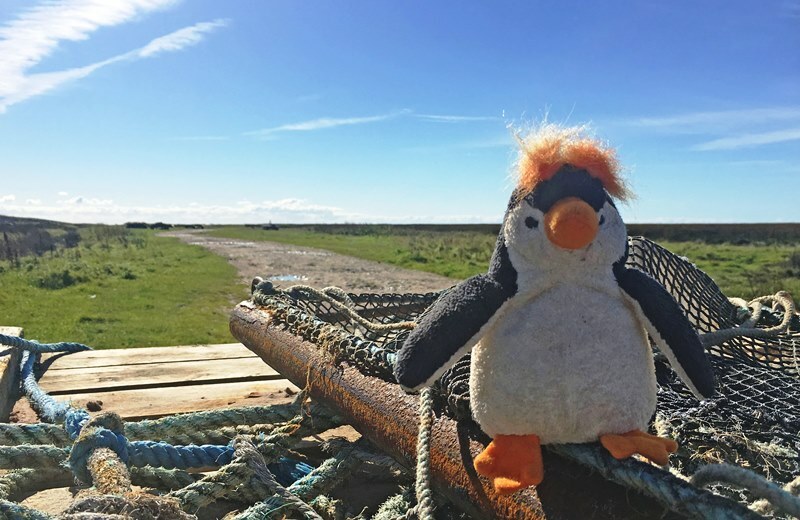 Along a narrow track to the sands of Morecambe Bay stood rickety fishing carts; Quirky Penguin seemed to be enjoying the sun here! I didn’t have time to visit the Lakeland Miniature Village but if you have children, or even if you don’t, it’s a charming attraction. 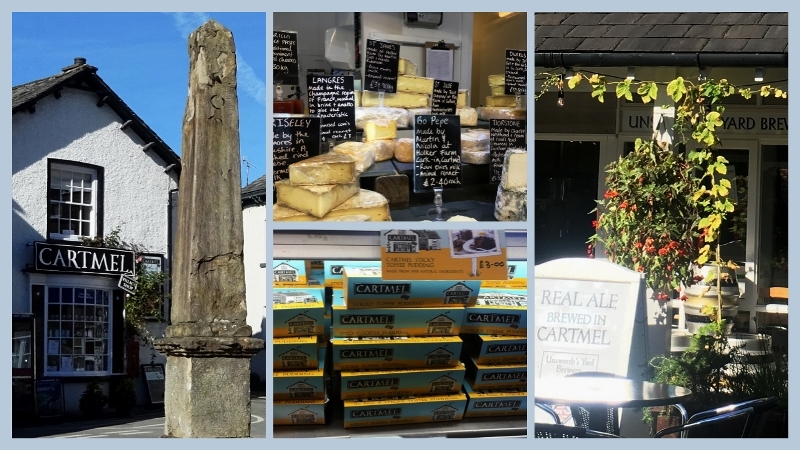 I made a brief stop at the Engine Inn at Cark-in-Cartmel before heading off for the highlight of my day out around the Cartmel Peninsula. 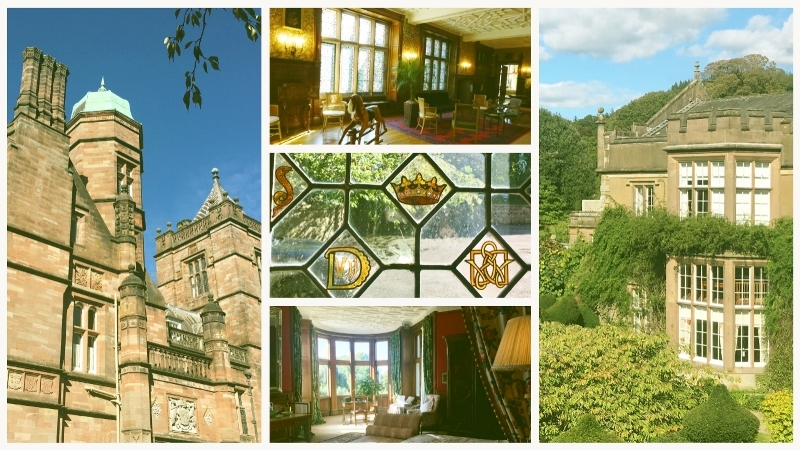 Owned by the Cavendish Family, Holker Hall is a magnificent house, originating in the 16thC and signifciantly rebuilt in the 1870s following a terrible fire. I was given a guided tour, learning about the family history and the many fascinating objects, artworks and elegant furniture. I walked out the Labyrinth for a bit of relaxation before a rather late lunch. Good news; Holker Hall takes the Lake District Pound. It’s a new currency available to buy and spend througout the Lake District and Cumbria. You can see more in this video of the launch earlier in 2018. 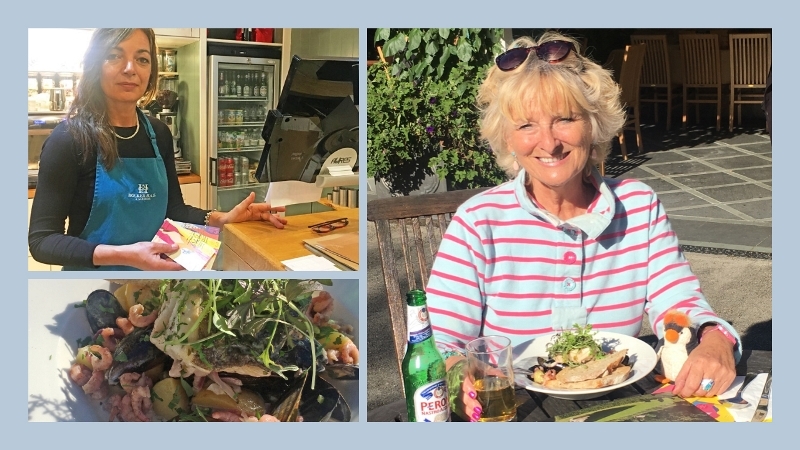 The Courtyard Cafe was basking in warm sunshine so I paid for my meal with Lake District Pounds and had my my meal outside. A huge bowl of Seafood Chowder, washed down with lager, satisfied hunger pangs and I was ready for the next stage of my journey. One of the major attractions of this area is the Lakeland Motor Museum, which I was delighted to find also takes the local currency. 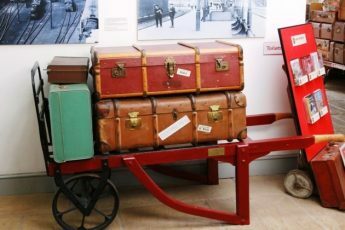 Housed in a converted mill, the museum has over 30,000 exhibits tracing the development of road transport throughout the twentieth century and showcases local history. It also has the Campbell Bluebird Exhibition, a tribute to the racing careers of Sir Malcolm and Donald Campbell. I had a coffee at Cafe Ambio and sat outside listening to the River Leven hurtling down towards Morecambe Bay. Driving on I had two more places to visit before heading home. Lakeside is a great place for all ages as it has three attractions on one site and is ideal if you want to Drive Less and See More of the lakes. The Aquarium of the Lakes has a fine collection of fresh water fish and some very popular otters. 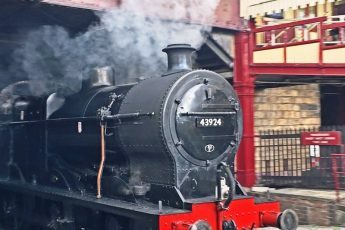 The Lakeside and Haverthwaite Railway has steam engines and the Windermere Ferries take passengers down the lake to Bowness and Ambleside. My final stop was The Swan at Newby Bridge. 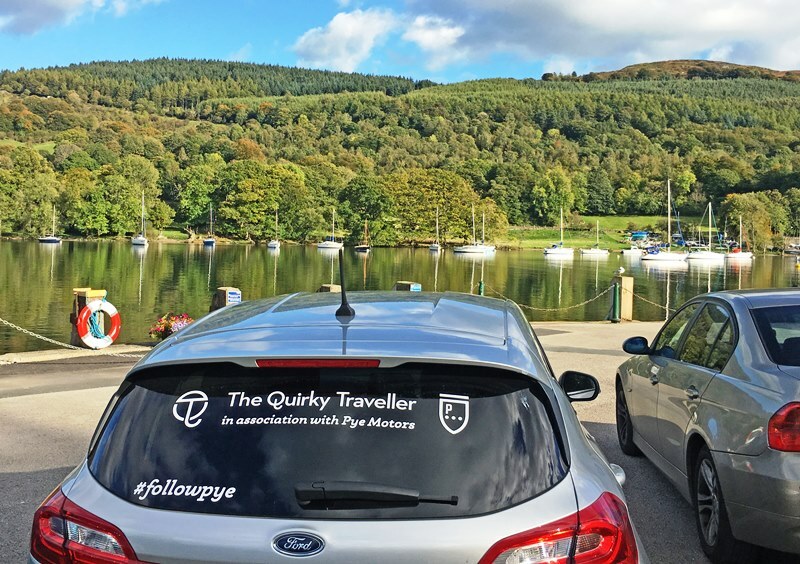 This popular hotel is right next to the river and a marina near the head of Windermere lake. 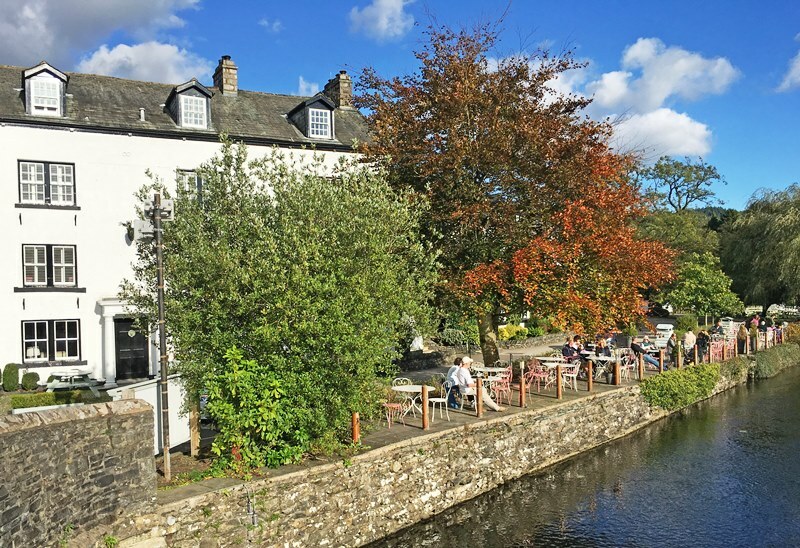 It’s an ideal place for a meal, snack or drink and I enjoyed half an hour relaxing after a really wonderful time exploring the Cartmel Peninsula. Family-run Pye Motors has a well-established local presence and has been here since the 1930s. MD Nick Payne is passionate about the area and it was his idea to do a series of days out around Morecambe Bay using the Seldom Seen Maps. Disclaimer: Pye Motors provides me with a fab Ford Fiesta and I am delighted to be an amabassador for this excellent company. Of course, all views are my own. It’s such a treat to be exploring Morecambe Bay in this way. 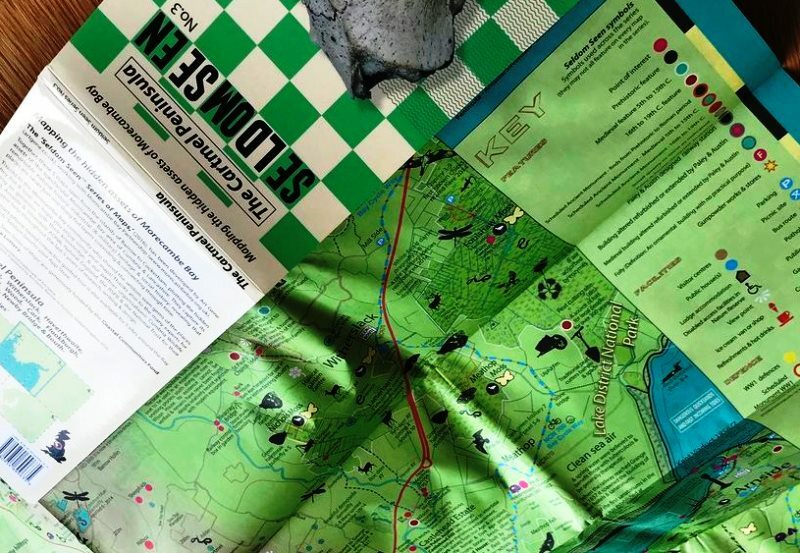 The Seldom Seen Maps are a real treasure trove of fascinating facts, intriguing places and great artwork. Yet more great places to see around Morecambe Bay. 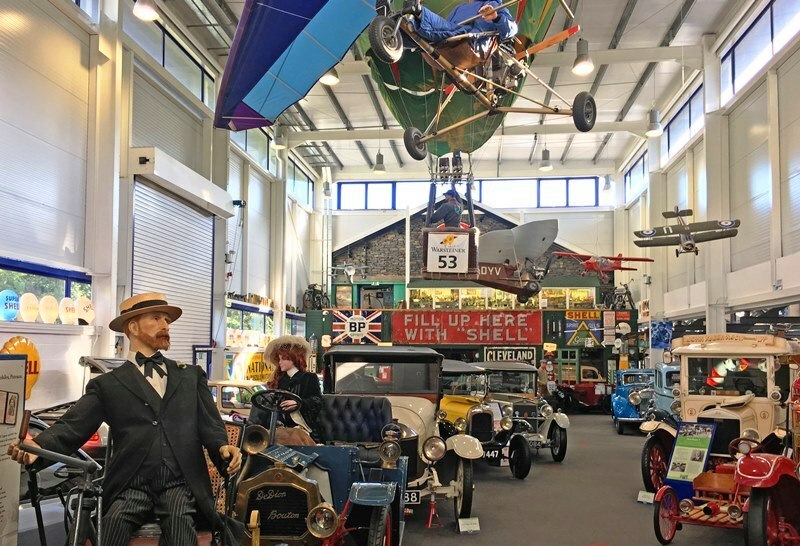 Must visit the Motor Museum – looks really interesting. We regularly travel round the Lakes but don’t know this area so well. Glad you enjoyed it Charlie. The Motor Museum is unique in having the industrial heritage and the Bluebird Exhibition.